There are several important reasons for using ballast on tractors. Tractors and combines often have to add weight to accommodate horsepower imbalances. Adding weight where required will improve traction and reduce slippage. Managing the ballast and tire inflation pressures can maximize traction, minimize compaction, increase the life of the tractor drivetrain, and increase productivity. Adding ballast to a tractor is an effective way to get the power of the tractor to the ground. There are general guidelines for ballasting a tractor based on the type of equipment being used. A Mechanical Front Wheel Drive (MFWD) tractor should weigh 120-145 pounds per PTO horsepower. 130 pounds is a common weight used per PTO horsepower. The weight split should be 35-40% of the weight in the front, and 60-65% of the weight to the rear. Some manufacturers recommend a 35-65% weight split as it makes it easier to control power hop. A 4 Wheel Drive tractor should weigh 85-125 pounds per engine horsepower. A general recommendation is a 60-40% split, with 60% of the weight in the front. 120 pounds is a common weight used per engine horsepower. This could change some due to the type of implements used. As in the case of the MFWD, power hop can be controlled by moving some weight from front to rear based on the equipment used. Implement dealers have calculators to best determine weights and weight splits based on the type of equipment being used and recommended by the manufacturer. Cast weights and liquid can be used to ballast tractors. Both have pros and cons. Cast weights on MFWD’s and 4 WD’s are easier to work with if power hop becomes an issue. Cast weights are the most convenient and can be changed according to ballasting needs. Fluid is more economical than cast weights, but fluid is harder to change. When adding or removing ballast, the proper weight distributions should be maintained for the tractor type. Once MFWD tractors are set up with the proper weights and distributions, they can basically use any type of implement without having to change weight distributions. The exceptions could be heavy implements on the three-point hitch or implements that place large loads on the drawbar such as rippers. These lighten the front end and may require more front weight. On 4 WD’s for towed implements, a 55-45% split (55% front and 45% rear) would probably be near ideal as this helps to control power hop. As the drawbar load dramatically increases in downward pressure, the weight splits need to move back to around 60-40% for optimum performance. There are potential problems that can be discarded by the correct tractor ballast. If tractors are under ballasted, there is too much slippage. 5-15% slippage is considered in the normal range with 8% slippage considered optimum. Too much slippage effects fuel consumption, field operating time, and tire wear. Over ballasting also has a potential for problems. This can cause tire failures by tires slipping on the wheel, and lug cracking. It can also cause drivetrain problems, increase soil compaction, and reduce efficiency. Air pressure in the tractor tires also greatly affects soil compaction. The heavier the tractor, the more air pressure that needs to be used to carry the load. Increasing air pressure equals increasing ground pressure. By optimally ballasting a tractor, the correct air pressures can be used and thus reduce soil compaction. Newer tire technologies are being used to further decrease soil compaction issues associated with heavier equipment. BKT makes the Agrimax Force for high horsepower tractors in an IF version. The IF will carry 20% more weight at the same air pressure as a standard tire. BKT also produces the Spargo in a VF version for tractors and sprayers. The VF will carry 40% more weight at the same air pressures as a standard tire. BKT is constantly developing tires with the latest technology to keep up with the ever-changing agricultural market. It takes a certain amount of weight for a tractor to transfer one horsepower of energy from the engine to the ground—figure 130 to 140 pounds per PTO horsepower for front-wheel assist (MFWD) tractors and 95 to 110 pounds per PTO horsepower for 4WD tractors. That often requires a little extra weight, which is called ballast. If you have too little weight, your tractor isn’t working as efficiently as it should. Your slip increases and you just aren’t getting all the power you paid for when you bought that machine. If you have too much weight, your soil compaction increases and your fuel efficiency can be reduced. And if the weight is poorly balanced, you can lose efficiency and experience power hop. Liquid ballast in the tire is a popular way to add weight to the tractor. However, we design tires to be filled with air, not liquid. So when you add liquid to a tire, you’re reducing the tire’s flexibility and performance, and deforming the shape of the tire. That can lead to irregular wear in the center of the tread, a harder ride, and significantly reduced sidewall flex. From a performance perspective, you’re turning a radial tire back into a bias. The bottom line is that if you’ve paid good money for horsepower, proper ballast is essential to make sure you’re getting your money’s worth. And if you’ve invested in radial tires, that ballast should really be achieved with cast iron weights so those tires can perform the way they were designed to. That way, you get the most out of your tractor and your tires. The right ballasting for tractors depends on many factors. Generally speaking though, the tractor should be as least ballasted as possible, if the ballast is not really needed. Each pound that needs to be moved forward needs energy during acceleration, creates more energy during braking, creates a longer stopping distance on average, and creates more soil compaction during operation on wet soil conditions. To prevent an unbalanced situation on the tractor, e.g. when working with a heavy front loader and adding ballast in the rear hitch or on the rear axle, or when using a front ballast as a counter weight for a heavy rear hitch. With higher loads on one end, the maximum speed may be reduced for both the axle and the tires. Ballasting can help counter this unbalance to lessen the need to lower speed. To make the tractor heavier to transmit more force to the soil, e.g. for implements with lower working speed like a plow where the operational speed is less than 6 mph. Here, all the engine power is transformed into a high torque on the axles, which means high forces in the contact patch between tire and soil. In this instance more weight means better grip for force transmission to the ground – so basically the weight supports the tire. Ballasting a tractor is the long time practice of adding weight to a machine for the purposes of counter weight to an implement, increasing traction, torque transfer, etc. There are many different ways to add ballasts; fluid in the tires, wheel weights, suitcase weights, ballast box, and more. In many cases, this is a guessing game for producers. Typically, I encounter machines with less weight than necessary to transfer the torque for that specific machine. In even more cases, not only does the machine not have enough weight, but most of that weight is on the rear axle. This would be an improperly ballasted machine. Depending on the machine’s use, improper ballasting will cost more time and money than most would expect. Fluid in tires, for example, is a very common and cost effective method of ballasting a machine. Unfortunately, the end result here is a tire that does not flex and, therefore, not able to perform as it was intended. Despite the achievement of adding weight and the perceived increase in traction, this stiff tire now has a much smaller footprint than it would if it were properly inflated. A smaller footprint means less traction. Less traction equals higher slip, more fuel consumed, greater soil compaction, rougher ride, and ultimately a very negative effect on yield. On the flip side, however, adding wheel and/or suitcase weights or a ballast box, you could achieve proper weight distribution for your machine and its horse power. As a direct result, you would gain better fuel economy, ideal slip, less soil compaction, a better ride, and increased yield. At Michelin, we strongly encourage producers to work towards proper weight distribution of their machine. In many cases this can be costly; however, we can work with the current weights on the machine and air pressures to transfer as much torque as possible. Each Michelin field representative is equipped with a set of tractor scales and the knowledge to calculate proper weight distribution to efficiently transfer the machine’s maximum torque to the ground. This should be an all-encompassing solution to maximize traction (which reduces slippage and soil compaction), torque, and fuel efficiency, minimize power hop and road loping, and overall productivity. Further, it is very important to keep in mind each task and corresponding implement can require different ballasts and tire pressure recommendations. For instance, a front wheel assist machine requires about 120 lbs per PTO Horsepower at 6 mph to fully transfer the torque. Additionally, of the total machine weight, 35% should be on the front axle and 65% should be on the rear axle. Let’s say you add a hitch mounted strip till on the back. Adding this equipment just changed the entire calculation. Now, you have to take into account the weight of the implement, while working in the field, and adjust your ballast weights and air pressures accordingly. Finally, this change only occurs a handful of times per year. Investing in ballast weights that allow you to change quickly and easily will give you the ability to properly distribute your machines weight for every season. Coupled with the proper air pressure, you will maximize your overall productivity! Ensuring you are using the correct ballasting weight is not always an easy exercise but ultimately it is one that is worthwhile. Unnecessary extra weight or not enough weight can both lead to higher fuel consumption as well as possible uneven tire wear and thereby increase input costs. Correct ballasting for field work is entirely about ensuring that slip rates are kept in the best window that allows optimum tractive efficiency & drawbar pull. Typical recommended rates of slip are 10-15% for 2-wheel drive tractors (2WD) and 8-12% for 4-wheel drive (4WD) or mechanically assisted 4WD tractors (MFWD). Too much weight can, in addition to using more fuel, mean not enough slip resulting in soil structure damage and possibly over stressing of transmission components. Too little weight results in slip rates that are too high which can mean longer time is required to finish the work and can also lead to excessive fuel consumption. It is worth remembering that soil compaction in the top 12 – 16” (30-40cm) is primarily a function of the tire pressures, below this level, compaction and structural soil damage is related to total vehicle weight. It is easy to see why correct ballasting that allows efficient traction and enables good speed across the ground is a major contributor to soil health. The best type and weight of the ballast should be assessed for each implement used and should be added to the front and / or rear to ensure optimum weight distribution between the 2 axles. The general recommendation for field work is to make sure that at least 20% of the total weight is on the front axle, this ensures good steering response and vehicle control as well as limiting the possibility of an adverse reaction between suspension systems and automatic draught controllers. For prolonged road work applications, a weight split of around 40% front and 60% rear should ensure good vehicle stability and control as well as ensuring that dynamic overload is not excessive when the vehicle is braking. It is also important to remember to alter your tire inflation pressures to suit the new load on the tires when weights are changed. Although it can be a time-consuming exercise, getting your ballasting right is an important tool in helping to optimise your input costs, soil health and wear and tear on your tractor. The tractor market has been evolving to larger and heavier units, with more power and more efficient transmissions, allowing for faster and more precise work in the field. However, farmers are considering the effects of soil compaction on crop health and yield in their buying and management decisions more often. Tire selection and tire management have not evolved in the same way, even though tires are the “link” between tractor and soil. There is no recipe that fits all situations as there are many factors to consider including varying soil types and conditions, implements used, working speed, tractor type and weight, etc. It’s a given that for the same weight tractor, a larger footprint on the soil (contact area between tire and soil), represents a lower superficial compaction of the soil (area where most of the roots develop). On the other hand, the higher the flotation, the lower the traction (less depth of the lugs in the soil) and vice versa. To make it a bit more complicated, the tractor needs a certain amount of weight to transmit power to the ground –which increases soil compaction. Given these dynamics, incorrect weight to power ratio, weight distribution, tire inflation pressure, tire size and footprint area for the application, can create lower efficiency and issues like power-hop, rim to tire slippage and tire to soil slippage. For a tractor to perform at its peak capabilities and efficiency, consider the following points. The first point is the correct weight and weight distribution that the tractor must have to transfer power with efficiency. As a rule of thumb, a correct weight ratio begins considering that between 100 to 120 lbs. per horsepower of the tractor is needed. Therefore, a 300 hp tractor should weigh approximately 30,000 to 36,000 lbs. This weight will allow the tire lugs to penetrate the soil deeply enough to create optimum grip and acceptable tire to soil slippage. The best way to increase a tractor’s weight is by adding solid ballast to the axles or on the tractor chassis. Adding weight by filling tires with liquid ballast is not recommended as it reduces the ability of the tire to flex, can cause corrosion of the rim and creates additional inertia on the wheel when moving. The second point is weight distribution. Once the correct tractor weight is defined, the distribution should be 50% on the front axle and 50% on the rear axle for 4WD. For a front wheel assist tractor, the distribution should be between 40-45% on the front axle and 55-60% on the rear axle. If the design of the implement creates a high load on the rear axle (reducing the load in the front axle), the ratio on front wheel assist tractor should be closer to 45-50% in the front and 50-55% in the rear. For 2WD tractors the front axle should have between 25-35% of the total load. It is very important to measure this weight per axle with calibrated scales (individual per tire or per axle, like on a grain elevator scale). An incorrect weight distribution can create issues like “power hop” where the front axle is too “light” (losing traction) and the rear axle is overloaded creating excessive “grip.” When a customer has power hop issues, it’s a clear indication that the total tractor weight and/or weight distribution is not correct for the application. This issue can be fixed by correcting the ballasting without the need to change tire size or tire ratio. The third point is tire inflation pressure. Each tire’s size load capacity changes with inflation pressure changes –the higher the inflation pressure (more air volume in the tire chamber) the higher the load capacity. This load capacity is defined by the type of tire (bias, radial, IF, VF, IMP etc.) and design (width, rim diameter and ratio), and is regulated by the TRA (Tire and Rim Association) in the US or the ETRTO (European Tire and Rim Technical Organization) in Europe. These two entities also specify the load capacities for each tire at different inflation pressures and in some cases working speed (this is not the case for IF and VF tires where the load capacity is independent of speed) to create “tables.” These tables allow the user to locate the correct inflation pressure when the load applied to each tire and the speed where this load is applied are known. If the tire is underinflated it can be damaged, i.e. slippage between rim and tire causing bead damage, etc. If the tire is overinflated it will reduce footprint, reduce traction (less lugs on the ground) and increase compaction. Using the correct inflation pressure will ensure the best performance, largest footprint, best traction and lowest compaction. A note related to minimum pressure – even if the load is low enough to allow for very low inflation pressure (below 10 psi), the minimum inflation pressure should not be below the 10-12 psi mark. Below this pressure value is risk of rim to tire slippage (especially with high horse power tractors in extreme torque applications, i.e. earthmoving) as there is less pressure from the tire bead against the rim flange, reducing the efficiency of power transmission from the tractor to the tire. Once these three steps are followed, the tractor should perform to its peak capabilities and efficiency. For further applications, steps one and two would not change substantially –only if the implement used is creating a dramatic change in “down force” on any of the axles, where a new calculation should be performed and checked for the required changes. The tire inflation pressure should be checked often, as tires that are not 100% air tight over longer periods of time and loss of air pressure will occur over time, also known as “air pressure bleed.” If there is not much change on the use of the tractor (implement used, working speed etc. ), a minimum preseason pressure checkup is recommended. Another last point to consider is the size of tires chosen for the tractor and the effect on the inverse relation between tractive efficiency and flotation-compaction. The larger the tire size, the larger the contact area between tire and soil (desired), lower superficial soil compaction (desired) and lower power transmission (not desired) due to less lug penetration. In the opposite way the smaller the tire, the smaller the contact area (not desired), higher superficial soil compaction (not desired) and higher power transmission (desired) as the lugs penetrate more deeply. Some sizes will be a given due to limits on equipment, limits on width and height of the equipment, tractor use (like row crop usage), but when we can choose the size, there will be a fine balance and trade-offs between soil compaction and power transmission. Ballasting has been utilized for equipment functionality and stability as well as transferring power to the ground. Many types of ballasting materials have been utilized including rocks, soil, cast iron, water, calcium chloride, magnesium chloride, beet juice and more. These options have advantages as well as disadvantages. Some are relatively cheap while others are expensive. Some are environmentally friendly and others not so much. Some have lots of versatility while others are not. The choice of ballasting materials includes many factors but the most critical aspect of adding ballasting is how much weight to add and where to place these materials. Agricultural and construction equipment with buckets or lifting forks have massive cast iron counterweights built into the design of the machine to provide functionality. Agricultural tractors have optional wheel, axle and suitcase weight packages to address total weight and the weight distribution that is critical to optimum performance. We will address ballasting as it applies to farm tractors. The first critical factor is knowing the engine horsepower of the tractor and the axle weights. Ideally, the weight per horsepower ratio should be between 100 and 120 pounds/hp. The lighter weights are more desirable and efficient as long as there are no performance issues such as stability or wheel hop. Increased weight ratios may be utilized to reduce slip which increases efficiency especially in demanding applications. The weight distribution is extremely important. For 2-wheel drive tractors the weight distribution should be 30% on the front axle and 70% on the rear. MFWD tractors should have 35% on the front and 65% on the rear axle. Four wheel drive tractors should carry 60% on the front and 40% on the rear axle. Allowances for additional weight due to attachments should also be calculated into your weight distribution adjustments. Wheel weight, axle weight and suitcase weight packages are utilized to obtain the correct weight total and distribution. Additional weight adjustments should include weight packages as the first option. Keep in mind that for optimum performance, the weight required often changes with the implement that is carried by the three point hitch or pulled with the draw bar as well as the application. Maximizing versatility with weight adjustments should be a major consideration. Adding liquid ballast into the tire’s air chamber is the least desirable. Liquid ballast reduces performance due to inhibiting the deflection of the sidewalls of radial tires. Liquid ballast is less versatile but may be utilized as part of your weight distribution program. Air pressures should be set just above the maximum load carrying capacity you are expecting from your tires based on the most demanding application. The calculated air pressures for roading are quite different from operational pressures for field work. Changing air pressures between road and field usage is time consuming and usually not practiced. Air pressures should be set for the road application due to the higher speeds which is the most demanding from a load carrying aspect. Under inflating tires will damage the tires and eventually lead to failure. Tires are too expensive to risk failure from under inflation for any of your applications! Correct weight distribution and overall weight totals are key to maximizing tractor performance and transferring power to the ground. Just like inflation pressures, making sure you have properly ballasted tractor will make it much more efficient when it comes to machine field performance. This doesn’t only include large tillage tractors but also ballasting is used on smaller utility tractors to help improve safety when using front-end loaders or three-point mounted equipment, such as mowers or sprayers, or when operating on sloped ground. Whether running in heavy tillage or moving heavy hay bales, the correct ballast is important. Fact is, too much weight can cause a tractor to feel sluggish, increase soil compaction, reduce fuel efficiency and result in premature drivetrain wear. Too little weight can result in tire slippage, reduce fuel efficiency and cause premature tire tread wear. Proper ballasting can be complex but there are many resources available online or even your tire dealer to assist with ballasting tractors. The end game is trying to minimize tire slippage when you head to the field. Between inflation pressure and ballasting you will have your tractor performing at its most efficient. Most manufacturers shoot for slip in the 8% to 15% range. Anything over that is extremely noticeable and not very efficient. Growers feel they are sending a lot of money with little return though the exhaust stack. Most growers I deal with do prefer to be running in the 3% to 9% range. At the end of the day, each grower needs to understand the factors involved and the objective for their individual operation. One end user may be okay with a little more slip and a lighter machine, while the other wants to pin all the power to the ground. Trial and error with an understanding of these factors and patience to experiment with different ballast packages will result in a well optimized tractor performing at the highest efficiency. Step One: Identify the horsepower rating of the tractor. For 2WD and mechanical front wheel drive (MFWD) tractors, the rated PTO horsepower is used. For 4WD tractors, the tractor’s rated engine horsepower is used. For the following calculations, we will use a MFWD tractor with 180 PTO horsepower being used to pull drawbar implements as the example. Step Two: Calculate the target total tractor weight. The target tractor weight is based on the driveline of the tractor. 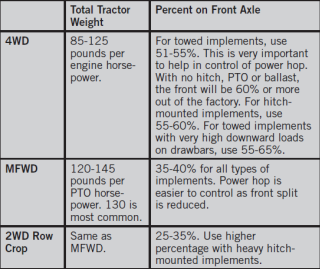 Chart 1 has the target weight per horsepower for the three types of tractor. Example Target Tractor weight: 180 PTO HP x 130 LBS/PTO HP = 23,400 lbs. Step Three: Calculate the recommended front and rear axle weight splits. Just like determining the tractor weight, the weight split is based on the tractor type and how the tractor is being used. Chart 2 has the target weight splits, according to standard industry practices. Keep in mind these are all target weight splits with no equipment mounted to the tractor. If 3-point equipment is being used, make sure there is enough weight on the front axle to keep the front axle on the ground. Front Axle 35%: 23,400 lbs. x 0.35 = 8,190 lbs. Rear Axle 65%: 23,400 lbs. x 0.65 = 15,210 lbs. Step Four: Weigh the tractor. The most accurate way to find the weight is to use a scale. This can be done on a platform scale or on portable scales. When weighing a tractor, make sure all the fluids are topped off, especially the fuel tank. If for some reason the tractor cannot be weighed, please consult your operator manual or your equipment dealership. With most newer tractors, the manufacturer has a procedure to calculate the tractor weight based on the base tractor and the weight package on the tractor. If aftermarket items (Saddle tanks, loaders, etc.) are added to the tractor, I recommend using a scale. Step Five: Add or remove weight. In most cases a tractor cannot be ballasted to the exact target weight outlined in Chart 2. In the example, the target front axle weight is 8,190 lbs., but it weighed 10,150 lbs. Let’s assume the example tractor has six front suitcase weights. Since the front axle weight is heavier than the target weight, we would remove the suitcase weight and re-weigh the front axle. Even though the suitcase weights are 100 lbs., they add 130 lbs. to the front axle because the weights are in front of the axle. When the weights are removed, the tractor is weighed and the new front axle weight is 9,370 lbs. Step Six: Set the inflation pressure of the front and rear tires. Now that the front axle and rear axle weights are known, we can use the tire inflation tables to look up the minimum inflation pressure required to carry the load. To help customers with setting correct pressures, most tire manufactures have free tire inflation pressure calculators on their websites or as an app. On FirestoneAg.com, there is a new inflation pressure calculator to help determine the recommended inflation pressure. With these calculators, all the customer needs to do is select the type of equipment being used, select the tire setup (singles, duals, triples), enter the tire size, and input the axle load. The calculator will determine the minimum inflation pressure required to carry the load. In this example, the front tires were 420/90R30 used as singles. The minimum inflation pressure to carry the 9,370 lbs. is 17 psi. The rear tires were 480/80R46 used as duals. The minimum inflation pressure to carry the 15,500 lbs. is 12 psi. When the tires are inflated to the recommended inflation pressure, the tire is able to develop the proper footprint. Proper inflation pressures allow the tire to develop the maximum traction, minimize tire wear and allow the tire’s sidewall to flex without causing damage to the tire. If the inflation pressure drops below the minimum recommended inflation pressure, the tire will over deflect, or squat more, which will cause internal damage or faster wear. However, over-inflating tires (even by 10 to 15 psi) will reduce the footprint size, reducing traction and increasing soil compaction. To get the most performance out of a tire, it is so important to check tire pressures daily when using the tractor. If a tractor’s setup doesn’t change, and the tire configurations stay the same all the time, the axle weights and recommended inflation pressures will not change on the tractor. But if the duals are removed on the rear axle, the inflation pressure on the inside tires needs to increase to 23 psi to carry the 15,500 lbs. If the tractor is going to pull a 3-point ripper, it is necessary to weigh the tractor with that 3-pt ripper attached to the tractor to get accurate axle weights. Those new axle weights should be entered into a tire inflation calculator to find the new minimum inflation pressure. Tractor setup and setting the tire inflation pressure is not a hard job, but it does take time to properly determine the weight needed on the tractor. Weighing the tractor, using tools like a tire inflation calculator to determine the recommended inflation pressure, and using an inflation pressure gauge to check the pressure are easy ways to remove the guesswork and increase efficiencies in the field.